What Is an App Launcher? You wouldn't initially think it, but your phone's home screen is itself an app. It's an app that launches other apps—an app launcher, if you will. But if the app launcher native to your mobile isn't up to snuff, you can always replace it. Aftermarket app launchers are essentially replacement home screens—they take over the duties performed by the factory UI—and they're generally aimed towards intermediate to advanced users looking for additional customization options. Given the Android system's existing propensity for customization, a large majority of the app launcher programs are coded for that OS—Launcher Pro, Go Launcher EX, and ADWLauncher EX being among the most popular. iOS devices generally need to be jailbroken in order to take advantage of a third-party launcher, however, once broken, the Cydia Store does have a decent selection of them. As for Windows Marketplace, well, not so much. App launchers, with some variation depending on their feature set, basically handle every function that the native UI used to do. 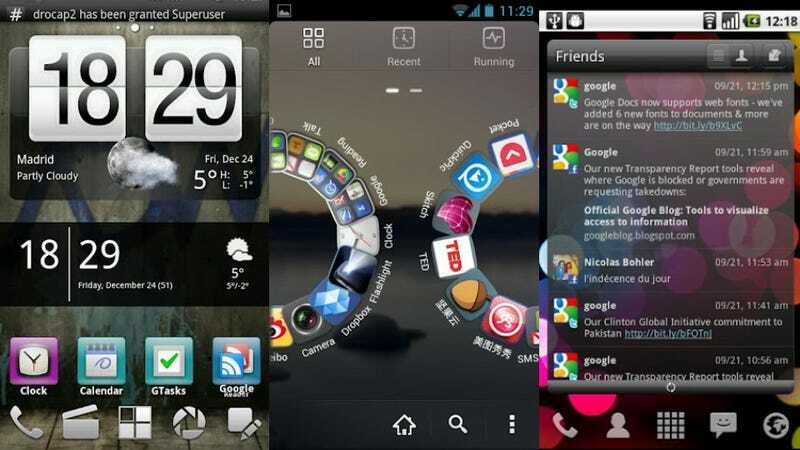 They manage the home screen, wallpaper, launch bar, app installations, shortcuts, and widgets. ...with a faster loading and more customizable interface. These launchers, unrestrained by corporate bigwigs and encroaching launch dates, have been optimized for peak performance. They often feature better response times, faster and cleaner screen transitions, and memory-consumption tweaks to squeeze every last bit of performance from slower handsets. As for features, they often include a wide variety of skins, icons and themes, they allow you to customize widgets, and they can create animated transitions between multiple home screens. In short, the user just gets a lot more control over the interface of the phone's operating system.